Measuring 7 1/8" long and weighing approximately 1.0 T. oz., this size spoon is variously identified as a place, dessert or oval soup. Solid silver, this plate measures 6" across and weighs 3.2 T. oz. For bread and butter, the form functions well as a wine coaster, and an item this size could accommodate a 1.5 liter bottle. The pattern is "Louis XIV" by Towle, whose "T around a lion" emblem, "Sterling," model number "5435," "Patented Dec. 23. 1919" all appear on the underside. This 4 5/8" long, 1 1/8" high, 2.8 T. oz., almond dish is a recast example of Gorham's model number "1990" piece. Please refer to preceding item 3221f for an example of the original item. While this is a relatively well executed instance of a reproduction, clear differences exist with an authentic, first run, piece. Gorham produced a number of items related in motif to its fabled "Narragansett" line, of which this 4 7/8" long, 1" high, 2.3 T. oz., almond dish, model number "1990," is an instance. Such pieces utilized marine forms, including shells, crabs, and barnacles joined together to form the end product. References indicate that William Braisted Heyer, born 1776, began his working career in New York City at the end of the 18th century and continued until his death in 1828, and for a short while during this time was in partnership with Jesse L. Gale. Based on its style, with a straight sided, rounded end, slender handle with a slightly tipt backside, this spoon dates circa 1810. Dominick & Haff "Charles II" Sterling Silver Cream Ladle, "Helen"
A late 19th century "Kings" pattern variant, Dominick & Haff's "Charles II" features a prominent raised shell on the handle front and concave one on the back, as well as a heavily beaded edge, along with honeysuckle detailing characteristic of "Kings." Measuring 8 1/2" long and weighing a substantial 3.8 T. oz., this is a nut serving spoon with a generously proportioned, four lobed, 3" diameter, reticulated and gold washed, bowl that is set on the same plane as the handle. Drawing upon Moorish, i.e. Islamic, design sensibilities, Whiting's 1880 "Alhambra" is a non-figural pattern akin to the company's "Arabesque" of the same period. This example is a 6" long, approximately .8 T. oz., sugar spoon with a gold washed, shell shaped bowl. Named for the renowned Florentine craftsman who embodied the artistic richness of the Italian Renaissance, "Cellini" by Wood & Hughes was issued in 1875 at the height of Renaissance Revival era in American design, and is one of the less readily found patterns of this period. All original with a deep green velvet back and a green satin front, set in a solid silver, 10 1/8" by 8 1/8" frame that by itself weighs 2.8 T. oz., this piece is marked "Web Sterling" and dates from the 3rd quarter of the 20th century. 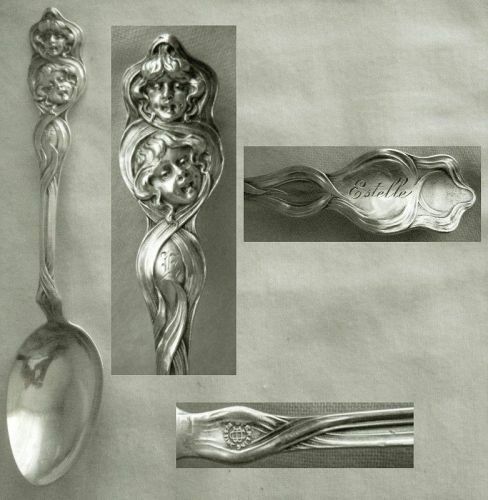 Unger Brothers "Cupid Sunbeams" Sterling Silver Teaspoon, "Estelle"
One of Unger Brothers renowned, early 20th century, Art Nouveau designs, "Cupid's Sunbeams" features the faces of two cherubic looking, probably female, figures. They are surrounded by trailing leaves that flow up the length of the handle of this 5 15/16" long, .9 T. oz., teaspoon. The reverse is engraved "Estelle" in flowing script, while the front has a small, Old English "E" inscribed in an open area below the figures. Full size dinner forks measuring 7 5/8" long each, and weighing a hefty 12.1 T. oz. 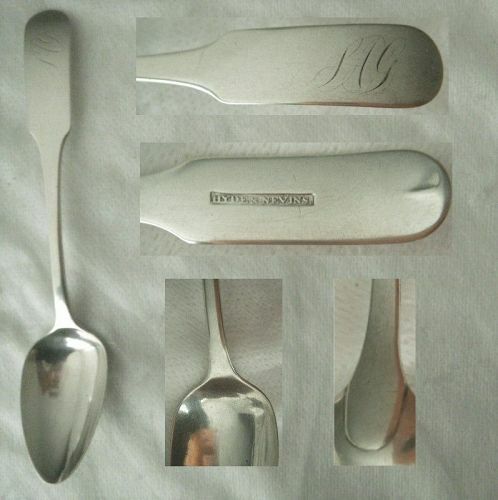 the group, these six matched pieces are marked with Gorham's "lion, anchor, G" emblem and "Sterling" on the handle reverses, and "Copyrighted" on the handle edges. A standard design that was first produced in the coin silver era, and continued after the adoption of the sterling standard in the mid 19th century, "Oval Thread" is a "Pointed Antique" with a tipped end and lined border. Born in Norwich, Connecticut in 1788, James Nevins Hyde was a silversmith with a presence in both New York City and New Orleans. This example of his work, a 5 7/8" long, .6 T. 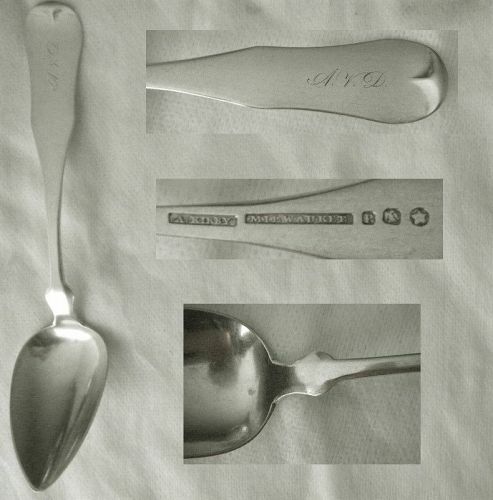 oz., "Reverse Tipt" teaspoon with an exposed drop, bears the mark "Hyde & Nevins," referencing his 1814-19 partnership with his cousin Rufus Nevins. Issued in 1963, Lunt's "Rondelay" is inspired by classic French design, but presented with a clean, modern flair. This example is a 6 3/8" long, quite heavy at 2.3 T. oz, gravy ladle with a 2 1/2" by 2 1/4" bowl that has decorated shoulders and a flanged rim. Never monogrammed and showing no signs of use, this flawless estate piece has a bright finish. Dorothy Rainwater in Encyclopedia of American Silver Manufacturers offers extensive biographical material about silversmiths Edmond Kidney and Samuel Johnson, who formed a partnership in 1868 that lasted until at least 1874. With working histories for each of them tracing to the early 1850s, they were already established names among New York City silversmiths when they joined efforts. 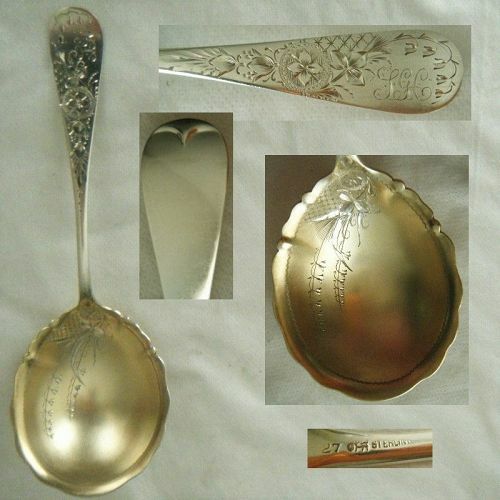 Engraved patterns were immensely popular in the late 19th century, probably because the capacity to execute reached a peak in that period, and the technique offered great flexibility in presenting intricate and varied designs. 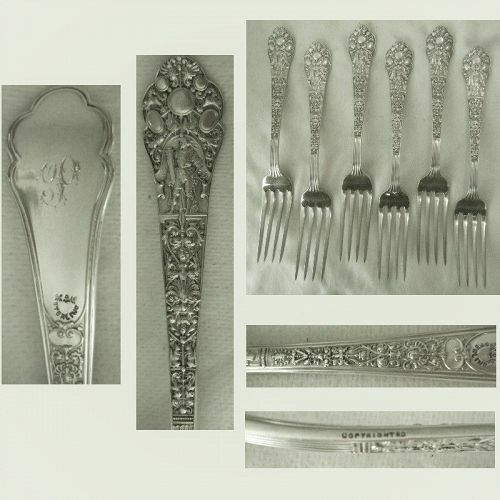 "Lily," which is actually a "lily of the valley" presented on an "Antique" form handle, was a popular motif offered by numerous manufacturers, none more successfully so than Whiting, the manufacturer of this 8 3/4" long, 2.6 T. oz., berry or large serving spoon.